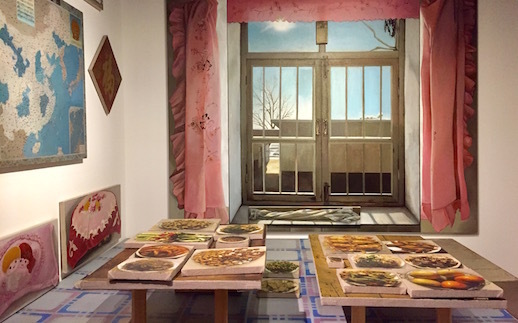 Yokohama Triennial, the massive contemporary art fest centered around the Yokohama Museum of Art, is back, this time pondering lofty ideas of connection, isolation, and human journeys. Headliners include Ai Weiwei, Olafur Eliasson, and Tsuyoshi Ozawa. Satellite venues like Yokohama Red Brick Warehouse have some of the most exciting works again this year, and visitors should also keep an eye out for Jenny Holzer’s textual proclamations at Minato Mirai Station and on the sides of shuttle buses. ¥100 admission discounts for up to two people with the MuPon museum coupon app. Through November 5. Koganecho Bazaar, first reviewed on TABlog in 2008, is an alternative art program pumping creativity and forward momentum into the down-and-out Koganecho area of Yokohama. Revitalization via art festival is a formula being tried throughout Japan to mixed results, but regardless of the actual economic impact, Koganecho Bazaar is succeeding in assembling some of the country’s most cutting-edge and socially conscious artists. Look for works by provocateurs Chim↑Pom, Fukushima installation and video artist Bontaro Dokuyama, Taiwanese street artist Candy Bird, and Aesthetica Art Prize-winning photographer Suzanne Mooney. Theatre director Akira Takayama will give performances on an art boat patrolling Yokohama waterways. Note that some of the works will still be in progress earlier in the festival. ¥200 discounts for up to three people with MuPon. Through November 5. Atsushi Watanabe is a recovered hikkikomori (shut in) whose work draws on Buddhism and traditional Japanese arts such as kintsugi, the practice of repairing and strengthening broken ceramics while emphasizing the beauty of their fractures in gold. “My Wounds/Your Wounds” displays his works from recent years, including kintsugi objects on which he’s written emotional scars submitted to him in messages; photographs of other hikkikomoris’ rooms with video of him pounding and prying his way out of the space where he once secluded himself; and – perhaps most redemptively – a collaboration with his mother exploring what it was like to be their respective sides of the door. Until August 27. How Many Nights presents the latest in Futoshi Miyagi’s ‘American Boyfriend’ series reflecting on the political and social issues of his native Okinawa. He also explores nationality, the legacy of the U.S. occupation, and identity as a sexual minority. His new 40-minute video with accompanying photographs and sculptures interweaves the stories of five women who lived from the turn of the 20th century through WWII. Ends August 30. Superflat star Takashi Murakami’s home base of Kaikai Kiki Gallery asks What Is the Relationship Between Ceramics and Contemporary Art?. Having once ridden the wave of the Bubble Economy himself, Murakami believes there are lessons to be learned about how ceramics became indicators of financial and cultural capital. Considering the fate of these “lifestyle crafts” after the Bubble burst, Murakami rounds up ceramics by prominent contemporary artists including Lee Ufan and Kishio Suga to test his theories. Ends August 30. Manabu Ikeda’s room-spanning, ultra-detailed pen drawings have won him acclaim around the world. Now his “Rebirth” (2013–2016), a work depicting a mighty cherry tree blooming in the middle of tsunami, comes to Mizuma Art Gallery on the heels of an exhibition at the 21st Century Museum of Contemporary Art, Kanazawa. Ikeda created this piece over a three-year residency in Wisconsin during which he broke his arm skiing and had to relearn how to draw with his left hand. The theme of rejuvenation has multiple meanings for himself and others. Until September 9. Ryushi Kawabata’s Bomb Exploding (1945) in Nihonga Goes Beyond the Bounds is not your typical genre fare. Showing leaves and flowers hurling through the air amid glimmering flecks of gold, it depicts the bombing of the artist’s garden during WWII. This work is just one example of how Kawabata reinvented his chosen style of classical Japanese painting while portraying the tumultuous era he lived through. Don’t miss Kinkakuji Temple on Fire (1950), his rendering of Kyoto’s Golden Pavilion infamous burning. Ends August 20. ¥200 off with MuPon. More of Kawabata’s oeuvre can be seen at the Ryushi Commemorative Museum of Art in Ota Ward. Families and design fans alike will enjoy this exhibition of European wooden toys at Meguro Museum of Art. See, touch, and play with blocks, dolls, and other excellent specimens of Reifendrehen lathe craft from central and northern Europe through September 3. Discounts of ¥150 for up to three with MuPon. Tokyo University of the Arts (Geidai) has opened its vaults at its Ueno museum, offering a valuable look at National Treasures and other works by some of the most important names in Japanese art history. Part II of the exhibition alone features masters including the perennially popular bird and flower painter Jakuchu Ito, Nihonga foremother Shoen Uemura, and Rimpa School founder Sotatsu Tawayara. You can also see graduation projects by distinguished alumni, a collection of early photography, a special set of papers by Leonard Foujita, and self-portraits by top contemporary artists like Takashi Murakami, Tatsuo Miyajima, and Fuyuko Matsui. Ends September 10. Chim↑Pom is known for taking its act to the street (and skies), but this time it’s the reverse. For Sukurappu ando Birudo Project: The Path Opens, it enlisted an architect to run a road through Koenji’s Kitakore Building in an experiment blending public and private space. Along with a string of parties and events attended by rebel darlings of Japan’s contemporary art scene, there’s art on display before it too is demolished with the rest of the building. The entire spectacle is a build-up to the book “Toshi wa hito nari” (Cities Become People) laying out Chim↑Pom’s theory of cities. Until August 27.